It’s that time again, dear readers, when we say to you: Happy Thanksgiving! 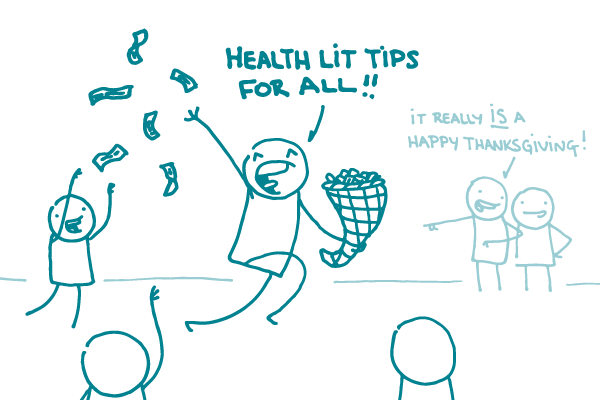 As always, we’re thankful for all of you — and for the chance to chat about health literacy with you every week. With all the focus on food this time of year, there are plenty of opportunities to share health information related to physical activity and nutrition. But it’s important to make sure those turkey tips and ground rules for the dinner table are accompanied by a dash of plain language — and a generous helping of sensitivity. With that in mind, we’ve harvested a cornucopia of tips to help you communicate about Thanksgiving so everyone feels like they have a place at the table. Acknowledge the holiday’s less-than-savory origins. You can promote safe turkey-cooking temperatures without erasing Thanksgiving’s colonialist history. For starters, skip the graphics of smiling Pilgrims and Native Americans. Make room for diverse food traditions. Biscuits or corn bread? Apple or pecan pie? There are lots of regional, ethnic, and cultural differences on the Thanksgiving menu. Be aware of the range of traditions, and remember that not every table has a turkey on it! Balance health with happiness in menu advice. Healthy food choices are important — but so is sharing and enjoying food with family and friends. Focus on the health benefits of a homemade meal, and go easy on the pie-related value judgments. Remember, no one is ever thankful for body shaming. Skip the tips for “working off” the feast. We all know physical activity is key to good health, and it’s no secret that Thanksgiving means extra calories. But rather than focusing on stressful caloric calculations, try highlighting fun activities that help families get moving. After all, spending time with loved ones is the real reason to celebrate. The bottom line: When writing public health messages about Thanksgiving, a bit of sensitivity and thoughtfulness can make a big difference.